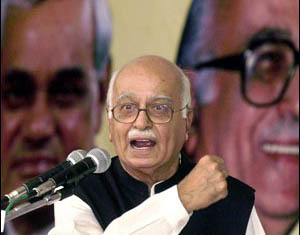 8 Apr : BJP Prime Ministerial nominee Lal Krishna Advani on Wednesday filed his nomination for the Lok Sabha election from Gujarat’s Gandhinagar constituency, going to polls on 30th April.A sitting member, Mr Advani has been representing the constituency since 1991. A beaming Mr Advani was accompanied by Chief Minister Narendra Modi and Gujarat BJP President Purushottam Rupala, when he arrived at district collector’s office a few minutes before the auspicious time.Mr Advani filed his papers exactly at 1239 hours. Speaking to the gathering after filing the nomination, Mr Advani said, ”I am happy that I am filing nomination from the Gandhinagar for the fifth time. We will go to the people with an issue of good governance. The development that the state has made under the leadership of Mr Modi is not only commendable but unparallel. Gujarat model of development is appropriate not only for India, but the whole world.”Noted danseuse Mallika Sarabhai is pitted against Mr Advani as an Independent, while the Congress has fielded sitting MLA from Kalol Suresh Patel in this constituency.